These babies have been put away safely in my closet for about a month now, but I never got the chance to show them to you. I was shopping in Düsseldorf with my mom, my sister and brother-in-law and of all the Chanel-stores I've been to up 'till now, Düsseldorf has the best selection (except for Paris, of course). 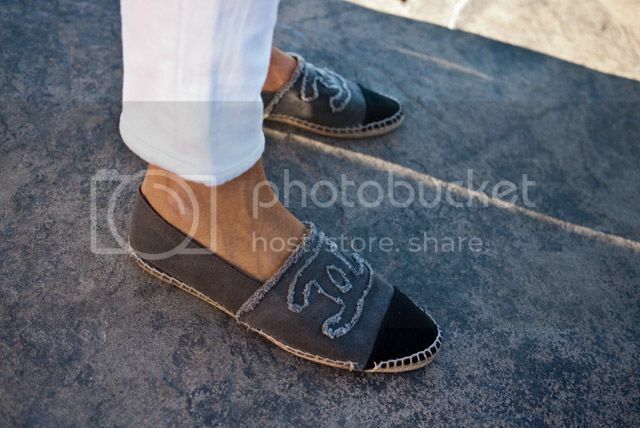 I've had my eyes on these espadrilles ever since the Chanel Cruise-collection hit the web, but my budget didn't allow me to splurge on anything. I then found my first 'job' as a teacher (well, I was just replacing someone who got sick) and I received my very first real paycheck. The perfect opportunity excuse to buy myself a little something, right? My sister and I used to wear espadrilles non stop when we were little. Whenever we went to Italy, my mom would buy them in tons of colors for only a couple of bucks. Aah, the good old days. There were several colors available in Düsseldorf, but I don't see myself wearing a pair of lilac espadrilles any time soon, so I decided to go for neutral beige with the famous black tip. I can't wait to wear them with a my leather pants -- Yes, I'm pretty sure it'll be a positive match. 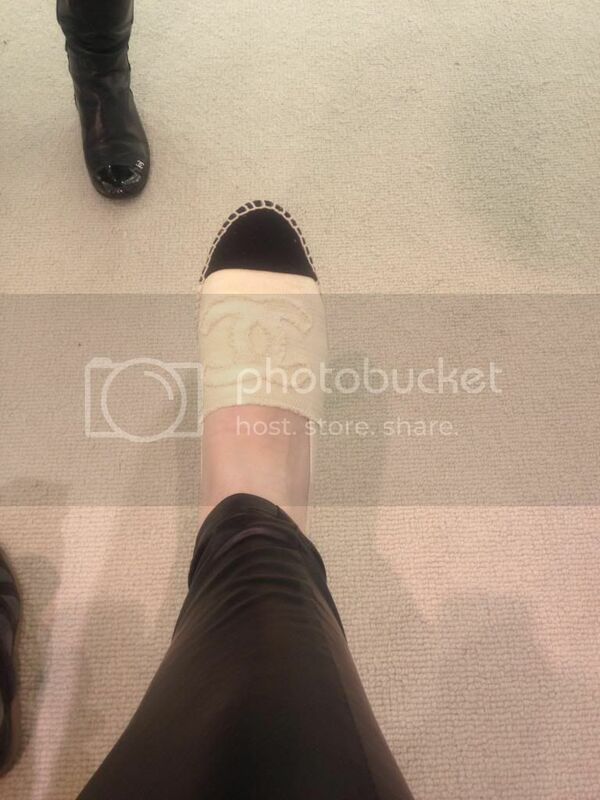 These shoes have to be the cheapest pair in the Chanel-stores right now and if you're planning on buying a pair, you have to keep in mind that they size small. I'm a size 39 and I had to get a 40. I've seen the espadrilles pop on tons of blogs for the past two or three weeks. Chiara, Lizzy, Caroline, Esmée, ... they all got them. I find it fascinating to see how a particular item becomes the most coveted item in only a short period of time. I mean, does it really depend on a handful of top bloggers to decide what's hot or not? I've been guilty of the Yves Saint Laurent Arty-ring and Maison Martin Margiela for H&M-booties hype, but only because I really love these items. I tend to let these hypes pass most of the time. Which hypes I'm talking about? The black pointy pumps and emerald green statement necklace by Zara, the white wedges by Mango, the tiger sweaters by Kenzo and so on. 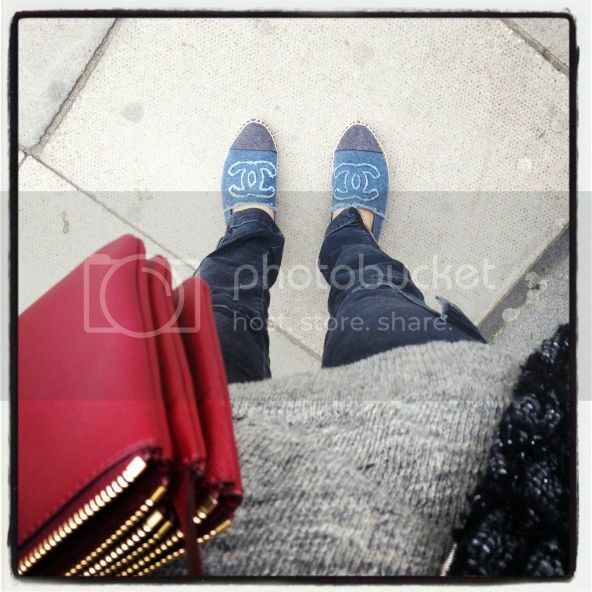 I took the Instagram-picture above (username: @Krizia_S) when I was trying them on in the store. Ik krijg meteen zin in de zomer! Heel erg leuk! Zo ontzettend gaaf! Lucky you! Ik krijg hier een zomergevoel van! Daar ga je nog veel plezier van hebben! Ik denk dat als je zoiets ziet bij een blogger het allereerst al ervoor zorgt dat je weet dat het bestaat :D en als er veel mensen zijn die het leuk vinden en vervolgens kopen is er zo een hype ontstaan? Zeker als meerdere bloggers het dragen omdat je dan meerdere keren met dit item geconfronteerd wordt :) Denk ik alleszinds! these shoes are just beautiful...really beautiful!! May I ask the price? LOVE the shoes. It's going to look great with your nautical outfits. If you get a sec, check out my latest post... 'Black and White from Day to Night'. Veel plezier ermee meis! Ik ben ook heel blij met de mijne, kan niet wachten tot ik ze aan kan.
Oh wauwie, mijn vriendin heeft dezelfde als de jouwe. I do love the pink ones as well. Oh wauwie, mijn vriendin heeft dezelfde als de jouwe en ze zijn echt supah nice! De roze zien er ook wel leuk uit :). Voorlopig zitten ze goed, al heb ik ze nog niet kunnen dragen, natuurlijk, haha. Tiany heeft ze wel al gedragen op vakantie, misschien moet je eens aan haar vragen? OMG ik ben jaloeeeeers!!! ik wil ze ook! Beige goes with almost everything! Ze zien er lekker comfy uit!!! Super! Ze zijn echt super leuk!! Your blog has very cool pictures and interesting ideas. I really liked it and will keep on visiting;) Come by my blog and if you like it let too, let's follow each other! Just let me know. We can follow each other on Bloglovin, GFC and Instagram too! Ik vind die rode echt super mooi, maar jammer genoeg kan ik ze met mijn studenten-budgetje niet betalen. Benieuwd naar de outfits die je ermee tevoorschijn gaat toveren ;) ! Ik heb deze beauties ook:)!! Exact dezelfde kleur, zelfde redenering als jou, timeless chanel colors! Maar ben aan het denken om ze ook in het mint te kopen, vind ze zo top:)! Can't wait for summer to wear them! Perfect for the summer! Prefer your pair to other colors. I'm going to buy a pair this afternoon in Paris ! I seriously cannot wait !